New Delhi: In a world that is urgently seeking technological answers to climate change, the quality of Indian research on renewable and clean energy has been deteriorating, a government study has found. This has serious implications for a rapidly developing nation such as India because it means indigenous green technology would be hard to come by. It also potentially ties the country down to imports, which are often expensive and have severe technology restrictions, especially with respect to intellectual property. 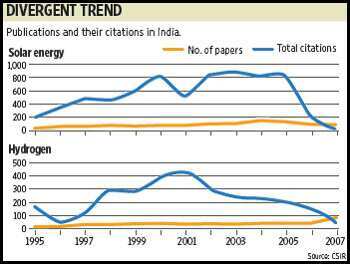 Although the number of research papers relating to coal, solar, hydrogen and fuel cells published by the country’s scientists has almost trebled between 1995 and 2007, citations of these, a key measure to gauge quality, have fallen precipitously. The study—conducted by the Council of Scientific and Industrial Research (CSIR), India’s largest publicly funded research body—found that from 250 publications in 1995, Indian universities and organizations including the Defence Research and Development Organisation, the Indian Institutes of Technology and laboratories of CSIR, published nearly 730 papers in 2007 on subjects related to renewable and clean energy. However, citations from these papers dipped from 200 in 1995 to less than 50 in 2007 for solar energy research; from 50 to 10 in wind energy research; from 120 to 60 in bio-energy and from 175 to 50 in hydrogen research. The decline in coal-based technologies has been the sharpest—from 750 citations in 1995 to only 50 in 2007. The study, tentatively named India S&T Research Output: S&T and Industry, is likely to be released later this month by science minister Prithviraj Chavan. The authors of the study said they have scanned for papers by combing the Web of Science database, a compendium of technical research that hosts research publications from at least 10,000 international journals. None of these authors gave comments for the story, saying that they weren’t allowed to do so before the report was officially released. Experts aren’t surprised by the study results. “The late 1990s and early 2000 was the crest of solar energy research in India. Around that time most of the researchers who worked on solar energy in the 1970s and 1980s began to retire. Plus, government froze scientific recruitment, meaning there was no new talent coming on. And third, oil prices were low then. So the Indian government actually disincentivized research in solar and clean coal," said a scientist who’s an expert on India’s R&D policy and is familiar with the report. He declined to be named. “That’s why the quality of research dipped." Prodipto Ghosh, former environment secretary and an adviser at The Energy Research Institute, said that India’s plans to establish a green technology fund as part of its national action plan on climate change would help research. “This (the current state of affairs) was part of a misguided government policy some years back to freeze recruitment," he said. “Now funds are more forthcoming." Ghosh also pointed out that high citations and good papers doesn’t necessarily mean much. “You need a good industry base to use that research."